1. Were you interested in holistic nutrition before you became diagnosed with cancer? My interest was piqued from visiting the Rancho La Puerta health ranch with my mom in my teen years (she was asthmatic and these yearly visits transformed her life). In the 70’s, my mom took sugar out of the house and she was a bit ahead of her time. Although, I hated it, these things certainly stuck with me. You don’t want to have to think about those things, but ultimately they come back to you when you need it and that’s really what it was for me. This foundation was laid in my youth and came back into my life when I was ready to receive it. 2. Once you received your diagnosis, what steps did you take to explore holistic alternatives that you thought might help you? My diagnosis really changed the course of my life. Up until that point, I was living a fast-paced life, existing on takeout, sushi, and stress was the daily norm. It didn’t take a lot of time after I was diagnosed with cancer to get into juicing, plant-based diet, therapy, yoga, colonics, and acupuncture. These felt more natural and healing then chemo and radiation (I opted out of chemo and did a shorter version of radiation). I went full speed ahead with these practices and continue to do so to this day. I was lucky to have a fresh juice shop in my area which is still is there today. I started drinking straight carrot juice and in time, gradually expanded to adding greens and other nutrients to my juices. I loved how I felt after yoga and getting into therapy for the first time in my life was a hard process, but really changed my life. 3. What was your biggest takeaway after beating cancer? You can heal anything. Cancer was a tap on my shoulder telling me that the way I was living wasn’t working. If you provide the right environment, the body CAN heal and wants to heal. I became a seeker of knowledge and still commit myself to getting to the root cause of any health issue so I help others to do so the same. 4. What do you eat in a typical day now? I start my day with a Bulletproof Matcha or Coffee (depending on the day and the amount of caffeine I want! ), next is a green juice (with no fruit) and flax seeds. Lunch is typically a raw salad with leafy greens lots of veggies, seeds and a vegan protein. I like to eat dinner with my family and have something warm and seasonal with either another vegan protein (tempeh is a big hit in my house), lots of green veggies, and a gluten free whole grain or 5 oz. piece of wild salmon. I stick to the rule of adding fats, greens, lean proteins, and complex carbs to make a complete dinner. 5. What is your favorite wellness trend right now? Mindfulness. We’re all moving a million miles an hour. I’m continuously reminded how much I need to slow down and I think we all need to be a little more mindful. It shouldn’t be a trend, it should be a timeless habit, but I’m happy to see a focus on it! 6. What podcast or book are you loving lately? I like Mind Body Green’s Podcast, That’s So Retrograde, and Lewis Howes’ “The School of Greatness”. I go through phases of reading, looking forward to The Medical Medium’s next book release on Thyroid Disease and just finished Dr. Aviva Romm’s book on Thyroid Health and it was fascinating! 7. What is your favorite mantra right now and why? 8. Do you have any morning rituals you consistently stick to? I wake up and drink 16 ounces of water religiously (I keep it by my bedside to make it really easy to do so). I like to read my friend, Ryan Weiss’s “Waking Up with Ryan” emails to set my intention for the day. 9. How can people work with you to cleanse their own bodies and lives? I want information on to be accessible to everyone, if you can’t come in and see me in-person for a session or don’t live in Los Angeles and can’t participate in my cleanse program, I post endless healthy recipes on my website www.elissagoodman.com as well as all the latest wellness topics. I also use my Instagram as a platform to share all my favorite products, recipes, health tips, supplement recommendations. You can also find my show The Elissa Goodman Show on YouTube, this is where I interview “wellness warriors” about how they’ve healed (lots of great tips for everyone in these interviews!). You can follow along on Elissa’s journey on Instagram at @elissagoodman and visit her website at http://www.elissagoodman.com. This interview is part of Happsters Happy Questions, an ongoing series of interviews that take a peek inside the lives of inspiring women around the world. 1. How did you decide to start your brand Philosophie and what is it? I decided to start my brand, Philosophie Superfoods, one day while on vacation in I Israel, when I was floating in the dead sea with my husband Adi. I had been a private chef and created cleanses for many clients. It would drive me crazy to be in the middle of a making a smoothie, or about to prepare a meal, and realize I was out of just ONE of my superfoods. I was tired of depending so much time driving all over LA searching for Maca, or Cacao, or Reishi, and wanted the ease and convenience of having a nourishing blend of superfoods all rolled into one package! 2. When you picture your happiest life, what do you see? I’m so lucky to say my happiest life isn’t far from what I experience now, tons of support, beautiful humans, lots of laughter and joy. When I walk myself through my “dream” scenario, I actually laugh because it’s very much similar to what my reality is now. I suppose feeling more financially stable would be nice and also traveling more as a family. Otherwise, I’m beyond blissed out most of the time! So grateful. 3. What attracted you to being a raw food chef? I loved the science behind being a raw food chef and know what a tremendous impact it makes on our bodies and overall wellness! Plants are so powerful and learning to create nourishing dishes was such a delicious thrill! 4. Is it important to have a morning routine? What does your morning routine consist of? I love my sacred morning quiet time before the kiddos are up. The first 30 minutes is when I try to get my meditation on to start my day off on the right foot. I try to find some beautiful morning light and get some stretching done as well. 5. What does a typical day look like for you? Every day is different! Time with my kiddos before school is a must, we always make a high vibrational breakfast together, either Green Dream Waffles or our home favorite Cacao Smoothie. Then, I get my fitness on! That could be a HIIT workout out front in my yard, or a sweaty hot8 class to stretch it out! I also love the occasional spin class at Soulcycle! After that, WORK TIME, whether I’m at home answering emails for my company Philosophie Superfoods or out in LA at a fun event with other awesome influencers, I’m always maximizing my “work time” for the day! Next, I’m able to pick the boys up from their darling Waldorf School and take them to get their flow on at our favorite yoga studio for mini’s, Soul Play Yoga, followed by picking up fresh fruits+veggies at the Culver City Farmers market! We head home in time to cook a delicious meal for dinner, normally that’s roasted veggies, hummus, lentils, salmon, tons of greens or a Cauliflower Crust pizza! I’m a big believer in balance, so great quality dark chocolate dipped in a yummy nut butter like Solstice Canyon, is always dessert! My bedtime routine is found here. 6. What is your favorite mantra that continues to be relevant in your life? Saying no to others is saying yes to myself. 7. How do you balance being a mom with your job? It’s always a juggle balancing being a mama and owning my own company. I have a great support system, from my amazing hubby Adi, to loving nannies and employees who all band together to keep this thing afloat! It’s not always easy but totally worth it, and wouldn’t have it any other way! I also love getting together with our mamas and seeing what works and what doesn’t work for them, and providing an outlet for each other! 8. If you could tell your past self something 10 years ago, what would it be? If I could tell my past self anything, I would say stand up for your beliefs and stay authentic to your needs. Don’t try and please others in sacrificing your own well being. It will always catch up to you. 9. Do you have any retreats or courses coming up that readers may be interested in? Thank you so much for hanging with me! You can follow along on Sophie’s journey on Instagram at @sophie.jaffe and visit her website at https://www.thephilosophie.com/. 1. Tell us a little about yourself! I have lived in Los Angeles for the past 13 years, though traveling is becoming more and more a part of my life lately. I currently share my love of photography with the beautiful souls that I am fortunate enough to call friends, and clients, all over the world. I teach yoga ridiculously early in the morning at Yogala Studio in Echo Park (an eastside enclave of Los Angeles) and I am a certified Reiki Master. I may have a small obsession with healing crystals. 2. What does a typical day look like for you? At the moment, I am incredibly grateful to have a life that allows for me to take the time to nurture my soul. At the moment, a typical day can look like waking up early to write morning pages, meditate and/or run reiki on myself. I have some incredibly supportive and loving oracle and tarot decks that I may pull cards from to gain extra insight for my day. Then I’ll jump into work. That may be a photo shoot or waiting for film scans from my lab or the always fun paperwork. Yoga. If I can end the day seeing friends, it’s been a good day. 3. What has been the biggest learning experience in your life? Loss. I’ve lost a lot of people I love very dearly. I came to the realization that these losses could either break me open or break me apart. I chose to open myself up and this choice helped me heal myself, forgive myself and others, and love myself more. Even though this cycle of loss began three years ago, I continue to learn knew ways of seeing the world on what feels like a daily basis. 4. What did you want to be when you were young? A photographer. But I was always scared that I wasn’t good enough, so I went into film/movies for a while, but I never stopped loving photography, and eventually, I let go of my fear and focused on my love of pausing time, of creating images that express the way I see the world. 5. For those unfamiliar, how would you define what Reiki is? The thing I love the most about Reiki is that it is channeled directly from the source, so it can do no harm. You are either open to receiving it, in which case you can receive it or if you are not open to receiving it…you won’t. Paula Horan gives a beautiful description of Reiki in her book, Empowerment through Reiki. It is an excellent read for anyone interested in learning more about this healing energy. I have pieced together a few lines from her description. Reiki is the Japanese word for Universal Life Force Energy. Reiki is a wonderful tool to help one develop conscious awareness. 6. Why did you decide to get Reiki certified? It was a part of my choice to open up and heal myself. I decided to get certified so that I could run Reiki on myself, so that I could tranform some very deep pain into something… else. 7. What has Reiki changed you? Regularly running Reiki on myself or having others run it on me has been a game changer. It allows me to be more at peace and more balanced in every day life. It has helped me open and heal old wounds, release old energy that no longer serves me, plus my cat cuddles with me more because she LOVES reiki energy. 8. I love your aura photos that you take! Can you tell us why you started taking these kinds of photos? The more I heal myself the more I have begun to feel a pull towards helping others as the embrace who they truly are…the person they have always been. One year after my partner passed, I went to the place we spread his ashes, to pay my respects, to take photographs, to grieve. The next day when I went to drop the film off at my lab, I opened the bottom of the camera thinking the film was rolled up. It wasn’t. I quickly closed the bottom, heartbroken that the images were going to be ruined; they weren’t. Instead, I discovered something new to me, a way to create beautiful effects that expressed how I felt. It would take another year before I did this intentionally. I was photographing a dear friend who happens to be a healer in Los Angeles. I felt compelled…my intuition strongly suggested…to expose some of her film to light, to see if I could mix her energy visually onto the film. It created some incredibly powerful images, and I knew I wanted to create more images like this, but I didn’t know how to make it work as a session. About 9 months later, I photographed another incredibly powerful Los Angeles Healer. This time, I wasn’t worried I was going to ruin the film. I just went for it, and after I saw her images – even thought my belly was filled with butterflies – I knew it was time for me to create a way to share this experience with others. It was time to encourage others to see their beauty, their strength, their abilities, and to help them share those aspects of themselves with others. What is your process for creating these aura photos? The aura adventure begins at a location where you are your most authentic self: in your home, at the ocean, in the woods… anywhere you feel joy! We will find a quiet spot and you will spend 15 to 20 minutes receiving Reiki (a healing energy) channeled through me. After your healing session, we will spend the next 40 minutes photographing you at your most peaceful, at your most joyful – meditating, dancing, twirling, moving your body in any freeing manner that makes sense to you in that moment. During this time, I will shoot 36 frames of film. Following the session, you and I will sit together while I rewind the film, holding an intention of authenticity and love. When the time is right, I will open the bottom of the camera to let the light in, to let your light in. One to two weeks following our session, you will receive 3 to 7 beautiful color photographs*. They will be yours to keep as a reminder of who you are, your vibrant spirit. *These photographs are not photoshopped. They are purely a mixture of film, you, me, and light. You can follow along on Tanya’s journey on Instagram at @lightleakauras and email her at lightleakauras@gmail.com. She is currently booking in Embrace the Light Sessions in Los Angeles and building wait lists for sessions in NYC and London and everywhere. A typical day for me would be to wake up feeling grateful for another day of life! I did not always feel this way, but I truly do now. It is not because my life has gotten so much better, it is more about my perspective being changed on life. I wake up early to meditate most mornings because I have two young boys, a dog and a husband. A quiet house for my morning meditation is amazing! I try to always get exercise and eat a healthy, protein rich breakfast with lots of water. I choose to take excellent care of myself everyday because I believe I am worth it. That does not mean I do not have indulgences like chocolate, bread and wine, but it means I try to have balance. Typically I am then busy getting my boys to school and working on my business. The day ends with a simple dinner and some tv or reading. Unless I have fun plans, I typically enjoy relaxing at night! 2. How did you decide to become a holistic coach and how do you describe what a holistic coach is? The call to do the work I do came to me at a very young age. I observed so much suffering around me and within myself that I knew deep down there had to be a better way to live. Through much of my studies over the years, I have grown and changed so much, but the lasting changes came when I saw my own anxiety and depression leave my life completely. I came to discover that my suffering came from my thoughts and beliefs about life. Once my perspective changed my whole life changed. My mission with holistic coaching is to help guide others to find their own freedom from suffering as well. Holistic coaching is a powerful form of life coaching that approaches every aspect of a person’s life – body, mind, and spirit – in relation to the whole. It can help you access your full potential and make transformational changes. 3. What book have you suggested the most to friends and why do you love it? Loving What Is by Byron Katie and The Power of Now by Eckhart Tolle would be my two favorite books of all time. They both teach you to love and accept this moment as it is. If you can love life as it is in each moment, you can do anything! 4. What has been the biggest learning experience in your life? Becoming a mother made me feel more vulnerable than ever before. It was terrifying to love someone so much and know you could not ultimately control their future or keep them always safe. It really opened up some big questions for me and helped me learn how to trust life on a deeper level than ever before. 5. It’s often said that life is about enjoying the little things. What are the little things that you appreciate? I really appreciate laughter, sunshine, exercise, good food and good company simply because I didn’t always appreciate these things. To say that I do now, feels really good. 6. What gives you energy? What depletes your energy? It gives me energy when I do something positive for myself and others. I am depleted of energy when I am being negative towards myself or others and when I say “yes” to something that I wanted to say “no” to. “I love myself.” If I love myself, I can truly love others. Life also finds a way to love you when you love yourself. It is simple, yet it can be so challenging. It just takes consistent practice! 8. Do you have any upcoming retreats or courses coming up that you’d like to share? You can follow along on Marie’s journey on Instagram at @miraculouslyyou and at her website http://miraculouslyyou.com/. Do you have a favorite style of yoga that you generally gravitate to? I enjoy all kinds of yoga – it depends on my day and my mood. During the week, I gravitate to Hatha, Flow or Power. On weekends I love do take a YHot yoga class in the morning. If I am feeling like I need a good slow stretch and go inward, then I go to Yin or treat myself to a Sage Aromatherapy Yin class. I don’t think there is a typical day! I get to work with so many amazing people in different areas of YYoga and I get to tackle different challenges and opportunities every day. One day I could be meeting with external retail vendors; the next day working on solving facility issues; the next day looking at potential new locations; the next day bringing our management team together to talk strategy. What has brought you the most joy during your time working with YYoga? Joy for me is a choice and created in each moment. It’s our people and our product that make me proud and fill me with joy each day. At YYoga, the majority of our team are women. Every day they get to see women in decision making roles, being authentic, and making a difference. I love being a leader and hope I inspire them as a role model to be fearless and happy! What book have you recommended to friends the most? What do you think is the key to a happy, joyful life? I approach the world through curiosity and adventure. I am happiest when my body and mind are strong; I am fully engaged in my relationships with others; I am exploring and learning new things; I am smiling and laughing; I am being fearless and going for it! Do something that scares you – it’s called growth. What is your vision for where you want to take YYoga? The dream is to take YYoga across Canada, in every major city and suburb, so that we can touch as many Canadians as possible! It’s about making people healthier and happier in their daily lives because I believe we can all benefit from what physical movement and mindfulness can do for our body, mind and spirit. It’s about empowering the people around me to grow in their careers, to learn about themselves, to collaborate as part of a team, to support each other along the journey and to embrace a big vision that brings YYoga to all of Canada. You can follow along on Carey’s journey on Twitter and Instagram at @cld604 and LinkedIn at www.linkedin.com/in/careydillen. 1. You’re a creative director, lifestyle blogger, wife and mom. Do you think it’s possible to have a perfect balance in life and “have it all”? I’m not too sure I believe in balance. I believe people need to make time to take care of themselves, pursue their passions and determine what is working in their lives and what is not. When people are fully in tuned with who they are than I believe they are able to create “balance” in their lives. I think when people do things for the wrong reasons than they do not feel balanced. I believe we should love our jobs and all aspects of our lives. If there is something that we don’t love than that’s when we need to stop and take the time to figure out what needs to change. 2. When you feel overwhelmed, how do you practice self care? I practice self care by doing things I love. Self care for me usually includes one of the following: painting my nails, coloring, painting, going to the beach, stepping outside for fresh air, mindful breathing, yoga or a brisk walk. 3. I love the concept of your painting and wellness workshops! Can you tell us a little bit about how those came about and what they entail? Thank you! The Painting + Wellness Workshops came about from a few different aspects. I wanted to try something new while also creating an event that could help women thrive. My regular workload typically consists of a lot of computer time and I want to be more in person with people. I have also attended so many events as a blogger where we are treated so well that I wanted to bring this style of event to any woman who wants to take a little time out for themselves. Each workshop includes information about self care and following your heart. I’m working on figuring out the details for the next workshop but I’d like them all to include an activity, a learning aspect and relaxation time. My purpose is to follow my heart and to encourage others to do the same. I want people to love their lives. I want people to take care of themselves, figure out what they love and do it! I have a lot of passions and I believe the workshops tie together all the things I love to do while encouraging others to thrive. 4. It’s often said that life is about enjoying the little things. What are the little things you try to take the time to enjoy? I take time to enjoy nature. A lot of people seem to take it for granted. I will sit in my backyard sometimes and just watch the birds, the trees and the clouds. I also take time to enjoy little moments in my kids lives and try to be as present with people as possible. 5. What is your favorite mantra right now and why? I have a lot! I often say Follow Your Heart. I believe we can get stuck in our heads when trying to make decisions but I think we really need to listen to our gut, our heart or our intuition more. We usually immediately know what we want to do when we follow our hearts. It’s our thoughts (or ego) that sometimes make us think we can’t do something or try to hold us back from what we really want. One of my other favorites is She believes she can, so she does! I believe we have the ability to create our own reality. Many people hold themselves back because they don’t really believe in themselves. I think the first step into believing in yourself is loving yourself, faults and all. I know this can be hard but not loving yourself is so much harder. I want people to embrace who they are and love who they are so they can fully thrive. When you fully believe you can do something than you will. This mantra keeps me going because if I don’t believe in myself, nobody else will either. 6. What does a typical day look like for you? During the week I get up with my kiddos, eat breakfast and take my daughter to school. Then my babysitter will come over for 2 hours in the morning to watch the little guy while I work. After she leaves I play with him than he takes a nap and I finish working for the day. When he wakes up we have lunch and play. Then we pick up my daughter from school. Typically we come home or on half days we go play with friends. We do household chores and play than make dinner. I usually take some downtime once the kiddos go to bed. Occasionally I will attend an event for work in the evenings or catch up on any projects with deadlines. Weekends we usually spend with friends and family or exploring San Diego. 7. Do you have a book or podcast you’ve recommended to friends the most in the last year? I’ve enjoyed “You can Heal Your Life” by Louise Hay. I also watch Gary Vee videos often. 8. Finally, are there any courses or workshops you’d like readers to know about? I will have the next workshop date available on BriGeeski.com within the next week or so. I am also finalizing some plans for painting classes coming soon! You can follow along with Bri’s journey on Instagram @brigeeski and visit her blog at http://www.brigeeski.com. 1. Do you have a favorite style of yoga that you generally gravitate to? I’m a Vinyasa girl, through and through. Coming from a dance and movement background, my body craves the creative free flow of the Vinyasa style. I was trained in Vinyasa in 2010 and that is definitely my roots and foundation, but as of the last year and a half, I’ve embraced Kundalini yoga and also Bhakti yoga. I have fallen in love with the concept of healing yourself from the inside out, using your breath, chakras, energy lines, and sound medicine. There are many paths to healing and growth, and I’m open and down for all of them! 2. What does your typical day look like? Well, I have a 10 month old baby girl named Luna Wild, so life these days is free flowing and quite unpredictable. There is always something exciting going on! Mornings now start around 7am with big smiles, cuddle fests and sing-a-longs. We make green smoothies and breakfast, then around 10am, our Nanny comes over and I start my “Mandy” part of the day. I take a yoga class, run errands, catch up on emails, then teach yoga either in the studio, on the beach, or at the home of my clients depending on the day. I allocate time each day to plant seeds for the future: my next workshop, goddess gathering, and my next yoga retreat. When it comes to work, I’m a big planner! I love to have my next 6-9 months of events mapped out so I can continually have new and creative offerings for my students. As the day winds down, my husband comes home from work, we take a beach walk and catch sunset together to decompress from the day. Then we make dinner, put little Luna to bed and have a few hours together to connect. Weekends are all about fun adventures! We usually explore around San Diego or hop down to Mexico for a few nights of being off-the-grid and more present with each other. 3. What gives you energy? A few years ago, I felt lost and a little confused about my purpose on this planet. I did a lot of deep healing work and learned a great deal of useful information about myself and my journey. I now know that I need a strong sense of community, with positive friends and family around me, as well as passion and purpose (and lots of delicious food in my life!) to feel energized and function at my highest. 4. What book have you recommended to friends the most? Modern: May Cause Miracles by Gabby Bernstein. This 40 day meditation and journaling “workbook” changed my life. Ancient: Tao Te Ching — a classic. 5. What do you think is the key to a happy, joyful life? You must laugh every single day. You must feel comfortable and loved/loving in your own skin. You must identify your purpose and pursue it passionately. These are my 3 non-negotiables and have helped me create a sense of deep happiness and daily joy. 6. What is the best piece of advice you’ve ever received? You are your own Medicine Woman. Quiet the outside noise, tune into your soul. Listen and all the answers will be revealed from within. 7. What is your vision for where you want to be in 10 years? 8. What is your favorite way to give back? Corazon de Vida Foundation. This organization is amazing! They oversee 13 orphanages in Baja Mexico, which is only 30 minutes away from San Diego. I’ve been involved with them for years. From the first orphanage visits where I fell head over heels in love with these children, to helping throw the annual fundraising Galas, I love every aspect of what they do and how efficiently and effectively they use the donations. If this type of service speaks to you, please join us! 1) For anyone who doesn’t know you already, how would you describe yourself? I think of myself as everybody’s cheerleader, I think everyone can do more than they think they can. I have hope for everybody and want people to be the best version of themselves. I’m very community-oriented and really want to make the world a better place through my company. 2) Why did you decide to start Hedley and Bennett? I have always loved design and food. I love looking at something and thinking of ways to make things better. I ask myself how I can make people and things better and more functional all the time. I used to work in a professional kitchen where the uniforms didn’t make us feel unified because they were such low quality. That’s where the idea began. I used to wear uniforms that had straps falling, the pockets ripping off, and the bottom fraying. I wanted to make them better so that people had a uniform that made them feel pride when they wore it. 3) When you picture a happy life, what do you see? I’ve learned that happiness is about the journey. When I landed my first big account, I thought “this is incredible”, and then quickly moved onto “OK, now what?”. I’ve found that it’s the steps along the way that make you happy. Happiness isn’t one finite thing. Rarely is happiness about the materialistic items. Those are awesome to have and money is something you need to sustain yourself, but for me I’ve realized money doesn’t make someone happy. It’s other things: It’s seeing my staff excited in the office or rolling out health insurance for our entire team, which we’re doing next week. That’s a big deal. Happiness is going for your goals and not standing on the sidelines. You have to jump in. There’s a ton of bad that happens along the way, but happiness is in jumping in. You have to “do” to find that happiness. Not all of it will be pleasant, but you have to feel the lows to get the highs. No one becomes successful over night. If it’s just for money, that peak high would be very short. You want to go for something bigger. So with Hedley and Bennett, I’m on the journey to being happy because every day we’re accomplishing a goal, all while hitting 15 bumps along the way. 4) What does your typical morning consist of? It’s a little bit varied, but if I’m in town, I get up and feed the farm animals (chickens and a pet pig). I take turns with my boyfriend on who deals with what animal each morning. Sometimes I’ll go do boxing or yoga or spinning at 7:30am before work. Both of us work from 9am to 9pm when we’re in town. We’ll get home around 8:30 or 9:00 at night so the morning is the only calm time. 6) When you’re having a bad day, how do you pull yourself back up? Typically if I have a really bad day, I’ll find time to go exercise. I get through a bad day with a combination of exercise, vitamins (liquid as opposed to caps), and random extreme sports that I’ll sign up for like marathons or a 300 mile bike ride for charity. I sign up for something like this every 6 months or so that I have to train for. It teaches you that you can do more than you think you can. 7) What is your favorite mantra that continues to be relevant in your life and why? My two favorites are “Don’t give up because you got a no. Keep persisting.” and “Wake up and fight.” We’re so lucky to be alive and have arms and legs and ears and eyes that work. Sometimes we forget that little significant detail that’s so apart of us. You have to remember the things that you do have and not just the things you don’t have. 8) If you could tell your past self something 10 years ago, what would it be? I don’t have a lot of regrets because I’ve done most things I’ve wanted to do. I always say “leap while looking.” Jump into the pool, but look around while you’re leaping. Figure out how you’re going to land, but leap no matter what. Don’t sit out just because you don’t know what’s going to be on the other side. I’ve always taken that approach to life. I’ve gone through amazing and not-so amazing situations, but at the end of the day I’ve done great things because of this mindset. I would say to my past self: Don’t stop. Keep leaping. Don’t slow down. 9) Do you have any tips for others who want to turn their passion into their career? Make sure that you’re really good at whatever your passion is. If you’re not good at it, practice a ton and get good at it. Get feedback from a lot of people who would be your audience in the future. Focus groups can include the people around you every day. I also recommend doing internships at different places that’s similar to what you want to do. Learn from the best and add your special sauce to the mix. Make sure you’re creating something special and different. Bring something different to the table instead of copying. Copying is an exhausting route. I’ve seen plenty of people try to copy ideas and they run out of ways. I created something that didn’t exist. We created a niche and made it what it is now. You have to find something you really love and that you care about enough to push the rock up the mountain even while it’s hailing on your head. Lastly, don’t feel like you have to be a business owner. The truth is that it’s hard to own a business. You can be an entrepreneur in someone else’s company. Thanks so much, Ellen, for the great interview! You can find her aprons and chef gear at www.hedleyandbennett.com. Follow her on Instagram at @ellenmariebennett. 1. Why did you decide to start Barre Body? Barre Body was born not long after I had my first baby, Xavier. I had been a yoga teacher for a long time and then started incorporating barre into my post baby yoga practice and noticed incredible effects with very little effort almost straight away. I loved how the small, controlled movements at the ballet barre made me feel stable and toned and shaped my body in a way that no other exercise ever had. It really is the most effective workout you’ll ever find and the blend of yoga, pilates and ballet barre conditioning means that it’s always creative and varied and you never get bored. I wake up at 5am so I can fit in meditation and yoga/barre practice before my children wake up sometime after 6. Then it’s a rush to get everyone dressed and fed and out the door for school and day care. Then I sit down at my desk and get to work. I do a lot of phone conferences and create a lot of online content now that I live in Byron Bay away from our studios so I have to be really creative about how I manage the team and how I connect with Barre Body clients and social media followers. I work until about 2.30pm and then we pick the little ones up and often go to the playground before coming home and starting on dinner. The afternoon and evening is for family and then I’ll often do a little bit more work and/or connect with my husband (who is also my business partner) after the kids go to bed. Then I get ready to do it all again the next day! I try to fit in a yoga class here and there and some me time when I can. I also travel a lot for work so I’m often in Sydney, Melbourne or Brisbane visiting our studios. 3. What book have you recommended to friends the most? A Return To Love by Marianne Williamson is a beautiful guidebook for how to live a life that is guided by love rather than fear. I also really like Big Magic by Elizabeth Gilbert which is all about nurturing creativity. 4. What gives you energy? Alone time. I really need quiet time by myself every now and again to fill me up. A walk on the beach or a yoga class usually does the trick. 5. What depletes your energy? Too many demands on my time or feeling anxious. 6. What’s your super power? I fall asleep the minute my head hits the pillow which means I get to make the most of those precious sleep hours and get up nice and early the next morning. I would also say my power of positivity! 7. What is your favorite mantra that continues to be relevant in your life and why? Live in joy. Be present. Do it all with love. This came to be at the beginning of this year and it was like it was to be my mantra or my guide for the year. I want to live joyfully and be present in everything I do and make all of my decisions and let all of my actions be guided by love. 8. How has being a mom changed how you’ve run your business? I was a mum before I started my business or rather, the two happened at the same time so I’ve always had to juggle the two demands on my time. I would say that as my business has grown and matured, I’ve been able to step back a little and give more focus to my children, which is a lovely way to be. It’s always a juggle though and so I just try to really BE wherever I am. If I am with my babies, I am 100% present and likewise for Barre Body. 9. If you could tell your past self something 10 years ago, what would it be? You are in for one hell of a ride. Trust yourself and amazing things are going to happen. 10. Do you have any self care rituals that you’ve found recharge you? Absolutely. Daily meditation and movement practices are central to my wellbeing and a peaceful state of mind. I also love baths and cups of tea! And walking is a favourite way for me to both exercise and clear my mind and allow my creative energy to come through. When I learned about the Almost 30 podcast a few months ago, I listened to it immediately and loved every second of it. I knew from the very beginning that these girls were my kind of girls. Definite “Happsters” at heart! 1. I love love love your podcast, Almost 30! Why did you decide to start it? LINDSEY: Krista and I were introduced by a mutual friend who knew that we would connect immediately. Our friendship is SO DAMN EASY. We have supported each other and have been one another’s sounding board from day one. Almost 30 was inspired by our deep chats about who, what, and where we are, as well as hilarious recollections of our early 20’s. We are both obsessed with finding the experts and guru’s, the practices and habits, the products and innovative ideas that will help us to be the best versions of ourselves. Sharing this with our listeners has been the BIGGEST GIFT. KRISTA: That means so much ☺ we love you. I can’t even remember the genesis behind starting the podcast, but we recorded for a few months in a closet before we shared anything. I have been a podcast fan for years, and felt like there wasn’t a podcast out there that spoke to women in their twenties and thirties about bettering themselves and navigating life’s transitions. We also wanted to bring together a community of women who could support and encourage each other (that’s our secret Facebook group!). 2. How did you two meet? LINDSEY: As I mentioned above, through a mutual friend! What’s funny is that we both lived in NYC before LA…and then both settled on the west side. KRISTA: Through SoulCycle! I was auditioning to be an instructor and Lindsey offered to help me out with my audition. After I moved to LA from NYC, I remembered how cool she was and asked her to hang out. We knew instantly that we had something special. Lindsey and I are super similar because we have the same dreamer mentality, plus we work wayyyyy too hard. 3. What has been the biggest thing you’ve learned since starting the podcast? LINDSEY: I’ve learned that when I am passionate about something and I have a clear vision, I have the power to commit and follow through. In the past, I had convinced myself that I should be grinding and miserably over-worked in order to achieve what I wanted. The moment I realized that the space between A and B was the best part, that I could actually enjoy the process and thus be inspired to create even more, was the moment I felt free to unapologetically take pride in my path. KRISTA: Podcasting has taught me so much! It makes me feel like there is something out there for everyone and to have faith that if you persist to do what you want to do. It may not be the first or second thing, but to keep trying. I LOVE my blog, The Hundred Blog, but knew I wanted to incorporate something else. I would have never done the podcast if I didn’t blog for a few years prior. Also, we’ve had the greatest guests on the podcast ever so each time we record I learn so much. As an example, in the Be Well By Kelly episode, I learned about incorporating the ‘Fab Four’ into your diet: Protein, Fiber, Fat and Greens. I try to incorporate that in most meals that I eat! 4. Do you have morning routines? If so, what are they? By then I am awake and have a clear sense of how I want to feel today. Then I can hop on my phone and computer and start to tackle the day! KRISTA: I do! I am in love with a good morning ritual. It’s super important and sets the tone for your entire day. I would much rather get up early than sleep in and feel late any day. I don’t keep my phone in my room, so my alarm in the kitchen will most likely wake me up. I get up around 5:30 AM and once I do, I’ll take a moment to put my hand over my heart and say thanks. Thanks for waking me up, for my house, for everything! After that I’ll drink warm lemon water (because people have said it works, ha) and then I’ll meditate on the couch for 10 minutes. I usually do a TM meditation and if I can’t get into it, I’ll just do affirmations. After that I’ll leave and go workout (I always get them in early) and then have breakfast when I return. Usually a protein shake + avocado + collagen + pearl powder + maca. I love Sun warrior Protein in Vanilla or Vega Sport (super smooth and delicious). 5. When you’re having a bad day, how do you pull yourself back up? LINDSEY: A great workout never fails to raise my vibration. It helps me to shake up any mental, physical, creative, or emotional blocks I might be experiencing. I also love being by water when I’m feeling off. Water is so calming and humbling to me, so I will usually take a walk on the beach to reset and recommit to the day. KRISTA: Meditation really helps me to navigate any bad day. It’s changed my life in that way. I know that if I do have a bad day, or a bad week, that it’s temporary and it won’t last forever. I also don’t attach myself to the feeling. So if I am stressed for some reason, practicing un-attachment really helps me to stay happy. I remember that feeling just ‘is’ and it’s not Krista. Or I’ll have a good vent session with my sister because what else are sisters for? 6. What is your favorite mantra that continues to be relevant in your life and why? LINDSEY: My potential is greater than any problem I have. My dreams are big. As I pursue them my mind tends to create problems, because, well, that’s what the mind does. It tries to protect me by looking for what could go wrong or what isn’t so perfect in the moment. This mantra/affirmation reminds me that the problems are specifically for me and I am more than capable of finding flow in any situation. KRISTA: My mantra is ‘I am’, which reminds me to always ‘be’ wherever I am, and that I can always consider myself at home. I repeat it whenever I need to be reminded to be more present. I also use it when I am saying my affirmations, I’ll use ‘I am…’ then add whatever I need to hear that day like “strong” or “golden” or “love.” After I meditate, I always do a few affirmations before I start my day. 7. Do you have any wellness rituals that you swear by? LINDSEY: I’m learning that if I don’t take care of me now, I will be useless for my dreams later. I use Saje essential oils before bed and to wake up in the morning! “Cleanse” is one of my favorites. I put it on the bottom of my feet before bed and I AM KNOCKED OUT and feel amaaaazing in the morning!! KRISTA: Honestly I have tried them all. Everything under the sun! I love trying new things, seeing how good I can feel and experimenting! I’ve tried LED Light Therapy, Cupping, Acupuncture, Reiki, Crystal Therapy, Cryotherapy…to name a few! This is so weird, but I swear by not taking birth control, ha. I stopped taking it 5 years ago, and have never felt better. My mood improved, I felt clearer, and my hair, skin and nails looks so much better – especially my hair! It’s never been so thick. I have the copper IUD which is amazing and non-hormonal. Once I got off birth control, I was also able to pay close attention to my hormone levels and feel so much more connected with myself. 8. You two have such a great bond. Do you have any tips on how others can find friends as adults? LINDSEY: Such a good question. It is so important that you follow what makes you happy and what fills you up. You will find like-minded people there. As I’ve gotten older, I’ve become more aware of what my authentic self feels like. The more I stand in that truth, the more people I attract who have similar goals, visions, love, light, and balance. KRISTA: YES. Definitely. A lot of the way that Lindsey and I met I felt like was divine timing. It helps that at this stage we know who we are and have similar interests. Along with that, we have a deep respect for the other person. Not only do I love Lindsey, but I respect her. She’s someone I would introduce to my parents, my lifelong friends, and my co-workers because you want to be around people that you’re proud to know. If you’re looking for to listen to you complain all day about your job you hate, how will that serve you? Find people you want to be like and be friends with them. You can also find friends as an adult by doing things you love, and standing in your light, you’ll attract the right people. I found Lindsey through SoulCycle and through that activity I did for me, I was given this friendship. 9. Do you think finding “balance” is possible? If so, what are your tips on finding balance in your life? LINDSEY: At this point in my life, balance means working really hard and loving it. I think balance will mean something different at various stages in my life. Right now I am happy and fulfilled in the work that I do, so that feels balanced. I have a wonderful group of friends, but I also truly value my alone time…that feels balanced. Krista and I are contributing so much to the podcast and putting in so many hours, but we are also having a blast and receiving so much from it. #ALMOST30NATION makes us so happy. That is balance. KRISTA: I love this question! I do believe that you can ‘have it all,’ but ‘balance’ I am not so sure! Both are in the eye of the beholder. I would not say that anyone in my life thinks I live a balanced life, but I’m so happy! I work 7 days a week – I have a 9-5, my blog and podcast. I don’t watch TV or relax much, but I wouldn’t have it any other way. Oh and if you think that you can have it all, you will. I believe that I have everything in my life that I need, and the universe responds to that by actually giving me everything I need. Also with balance, I’m vegan and gluten free both by choice and don’t drink alcohol at all. But again, this is what makes me feel good and happy. If there’s something that’s telling you that you’re not living a balanced life, then listen to that, but not to anyone else that could tell you that your life is unbalanced. I’ve had moments where I’ve pushed myself a little too far and I make sure to note that and chill out for a few days. You can find Krista and Lindsey online at www.almost30podcast.com. You can also follow them on Instagram at @almost30podcast and be sure to join their secret Facebook group where all the good stuff goes down here. 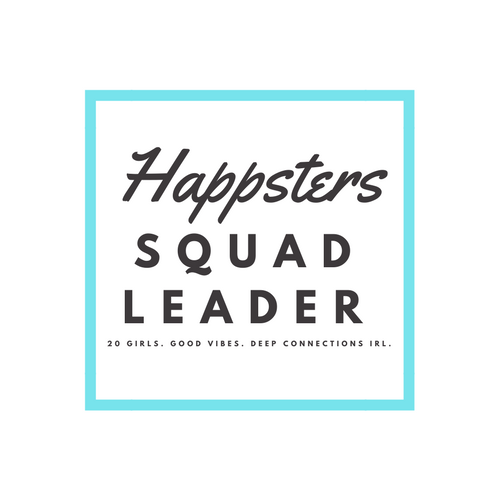 Interested in joining your local Happsters Squad? Apply now!